Parties to the South Sudan conflict signed a power-sharing deal on 5 August 2018 in Khartoum. The latest governance arrangement is part of several deals concluded recently. However, the numerous broken peace deals in South Sudan in the past raise concerns about implementation. PSC Report spoke to Nicholas Haysom, United Nations Special Envoy for Sudan and South Sudan about building sustainable peace in South Sudan. What is your impression of the South Sudan peace process? There was an unhelpful initial delay in engaging the conflict parties. In part it may have been caused by fatigue, due to the failed previous peace process. But regional leaders were notably reluctant to confront the government, which was a major player in the conflict and certainly responsible for some of the destruction, including an extraordinarily high rate of displacement both internally and externally. I think there have been frustrations on the part of the AU [African Union] and the international community with the slow pace of tackling this issue. They made a correct decision to place the responsibility for dealing with the conflict on IGAD [the Intergovernmental Authority on Development]. That is because if you do not have the region involved then you will not have a successful peace process. But this region is made up of countries with quite separate national interests. This is part of the difficulty the region faces in intervening as one unified actor. We have seen a distinctly more engaged peace process since June 2017, when IGAD appointed Ambassador Ismail Wais as the IGAD Special Envoy for South Sudan to lead the revitalisation forum. The critical measures taken were precisely the measures we had been encouraging for two years, such as the inclusion of Dr Riek Machar as well as other actors. This has now come to be an important element of a sustainable agreement and an inclusive peace process. There has been undeniable progress in securing agreement on certain issues, notably on security arrangements and governance issues, in Khartoum. I have pointed out, however, that there will not be international support for the outcome of the peace process unless there is clear evidence of the sustainability of any agreements. How do you rate the commitment of South Sudanese parties to end the conflict? How does one manufacture political will if the parties are self-interested, seeking only to maximise their sectional advantages and benefits? There is no clear answer. One can only make it clear to the parties that they bear the responsibility for making this agreement work and that if it fails there will be consequences for them. What is required from South Sudan now is to reach out to all elements of society and to make the necessary compromises and sacrifices which would make the agreement work. It is not a question of saying, 'What is my entitlement? What is my proper share? ', but a question of what will make it work. In other words, we are looking to South Sudanese to behave as patriots, not entrepreneurs. One of the tensions in peacemaking is, on the one hand, respecting the imperative of ensuring that there is ownership by the parties, that they carry the responsibility for making the agreement work. The international community has to respect the sovereignty of the country and the right of the national parties to make their own decisions and reach the compromises which they can live with. But, on the other hand, that does not mean that there should not be any pressure or arm-twisting. I think it would be wrong to say that the role of the neighbours and of the international community is simply to be an observer. The international community should press the parties on the question of sustainability, but not prescribe set solutions. I think we recognise the need to bring in all elements of South Sudanese who believe that they should have been engaged in the initial arrangements. There also has to be robust monitoring and supervision of the implementation of the agreement by both the international community and the South Sudanese. In addition, there has to be scrupulous economic control and transparency on the use of money, including oil money. There is a real need for the security apparatus to be removed from the control of any one of the parties. As regards the recent agreements, I am concerned that there is a security gap. There have to be measures which allow opposition politicians to feel secure if they return to Juba. What should be done to protect civilians and address the needs of refugees and internally displaced persons (IDPs)? The answer to that question would be that the general presence of peace, a peaceful environment, would help resolve those important concerns. But we have to also consider special measures in the event that there is no peace. There have been a number of attempts to secure an effective ceasefire. I think both the South Sudanese and the international community should insist that the ceasefire be respected, which would include a commitment to respect humanitarian law and unhindered humanitarian access for those in need. 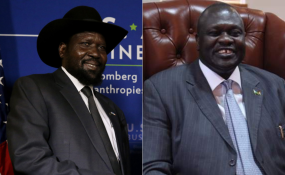 One issue which has exacerbated the South Sudan conflict is that it has taken an ethnic tone, so what may have been a political conflict has increasingly taken on an ethnic character with long-term consequences. In ethnic conflicts, communities attack communities, not their warriors, and the scale of destruction is consequently crueller. It leads to the destruction of communities, men, women and children, their homesteads, livestock and crops. It is for this reason that we have seen such staggering numbers of refugees flee from the country. This article was first published in the ISS's PSC Report.